It was September in England’s green and pleasant land. Would Jerusalem be built here in Kennington’s dark satanic mills? This was cricket of a significance in Britain that was unrecognisable to anyone under the age of 30. This was Ashes fever. This was 51allout’s mother being interested in cricket for the first time since 1981, when apparently she listened to Test Match Special on the car radio cradling her youngest son who was still in nappies. As the magical summer moved towards its denouement, it felt like everyone’s attention was on the cricket. Certainly everyone in an office out by the Bedford southern bypass had at least a passing interest in the score, even if they, like Daryl Harper, didn’t know the LBW law or even what LBW stood for. But for people who loved cricket, who had lived cricket since they were in poo-stained nappies on a Devonian seafront long before they can remember, this was everything. It was 30 July 1966, it was the moment we first heard Don’t Look Back in Anger, it was the death of Diana, hell it was the moon landing. England were 2-1 up and there was just the one match to go. The swords were in hand, the mental fight was ceaseless and the builders were drinking tea whilst discussing what kind of foundations the London Borough of Lambeth Council would require for this Jerusalem of south London. The toss: Vaughan calls correctly. The Oval erupts as if Michelle Ryan (fourth best looking woman in the world in 2005, according to the readers of FHM) was cartwheeling naked around the boundary edge. England bat, natch. 700allout, please. Michelle Ryan struggled to comprehend Mark Nicholas asking about the toss. Stumps on day one and England were 319/7 – good but not as spectacular as hoped. Andrew Strauss made his second century of the series – 129 – supported by Andrew Flintoff’s 72. Shane Warne took the first four wickets to fall, and that of Strauss as well. Australia then bowled England out before lunch on Friday (373, Warne taking six wickets in total) and started their innings steadily. Throughout the afternoon Langer and Hayden pushed things forward, reaching 112/0 from 33 overs. But what was that in the sky above the capital? Only bloody lovely rain. Day three comprised only 45.4 overs; it began with the gruesome twosome pushing their score onwards. Langer’s 100 came in 142 balls, before falling to Harmison with the score on 185/1. Hayden’s seemed uncharacteristically slow – 218 balls – as Australia reached 277/2. They were within 100 runs, but again, the rain clouds hung low. However the Aussies needed to win the match to retain the Ashes. The Aussies – the bestest, most bravado, swaggering and attacking team of the last twenty years, if not ever. Their batsmen wouldn’t be put off by a bit of late summer drizzle would they? But Damien Martyn and Hayden scurried to the dressing room like school girls running inside at wet-break. To be fair, it was wetter than we remembered. Sunday. Still everything to play for. The fear across the land was that Australia would go and make another 250 or more. Once more entered Flintoff, who had already taken the wicket of Ponting the previous day. His spell lasted 18 – eighteen! – overs, of which 14.3 – fourteen and a half! – were on this fourth day. If he never bowled this well again, at least he left his body and mind out on the battlefield. This was an England attack missing Simon Jones, but Flintoff’s superhero act wrestled control back to the home side. He finished with 5/78, ably supported by the unsung Matthew Hoggard’s 4/97. Australia lost seven wickets for 44 runs and Flintoff had somehow given his team a six-run lead. But…but never rest easy with England. This Greatest Series wouldn’t have been so great if the victories had come easily. Nor would the Australians hand over the urn (metaphorically speaking of course) without at least some fight and fury (particularly as it was dry, so the little darlings could play safely without getting wet). And never underestimate the ability for Englishmen – whether via Papua New Guinea, Preston or Pietermaritzburg – to collapse in a quivering heap. Warne bowled the fourth over; Warne dismissed Strauss with his fourth ball. The heap was beginning to form. England were 34/1 at stumps and still nervous. I don’t know what my work timesheet says for that 5th afternoon (I think it was probably a rather long ‘site visit’), but I do know for sure that I spent it at home. Test Match Special and Desktop Richie had sufficed for most of the weekday’s plays, but there was no way I was going to miss the final day. England were 67/1, when Vaughan was caught behind. Ian Bell edged the next ball to Warne at slip. Glenn McGrath was thus on a hat-trick: Kevin Pietersen tries to evade a short ball, which ricochets to slip. Several million ockers appeal. Bowden is unmoved. The shoulder the ball hit was human, not arboreal. 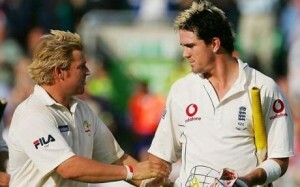 With the score on 84/3, Pietersen edged Brett Lee. You might already know what happened at slip. Unthinkable from Warne. The culprit bowled the next over: two sixes smote from Pietersen’s blade. The future Mr Liz Hurley shakes the hand of the future Mr Jessica Taylor. Pietersen took lunch on 35* (England 127/5). Geraint Jones fell at 199/7 and although England were probably safe, there were still doubts. But Pietersen was there on 90*. He needed someone to stick around with him; Ashley Giles did more than that – his 59 was to be his highest Test score and took up more than two and a half vital hours. When Pietersen was finally dismissed for 158, England were pretty much over the line. However the match finished in an anti-climatic shambles. There were a token 18 overs remaining that evening. Quite what the Johnny-Come-Lately new cricket followers thought as Harmison bowled four balls to Justin Langer, who was then offered the light by the umpires, remains to be seen, but I found would have found it ridiculous, had I cared (cups of tea had long been replaced by something stronger). Some time later, the umpires returned to ceremoniously remove the bails. Despite Warne’s 12 wickets in the match (and 40 in the series), the match was drawn and the Ashes were regained. Champagne and MBEs all round! The open-top bus trip and visit to the Prime Minister may well have been a PR expert’s vision of what constitutes appropriate sporting celebration and with hindsight a somewhat excessive extravaganza, but at the time few were complaining about its crudeness. Vaughan, Fred and KP were household names, and Tony Blair got to meet Paul Collingwood. Its walls may have crumbled pretty soon after, but for a few weeks in 2005, cricket really did build a Jerusalem in England’s green and pleasant land.